It is often desired to use SSL connections for communications to avoid “man in the middle” attacks. 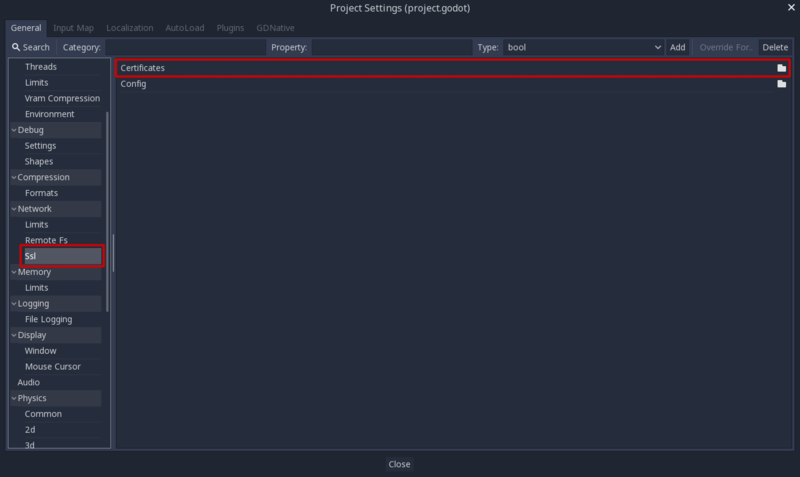 Godot has a connection wrapper, StreamPeerSSL, which can take a regular connection and add security around it. The HTTPClient class also supports HTTPS by using this same wrapper. This file should contain any number of public certificates in https://en.wikipedia.org/wiki/Privacy-enhanced_Electronic_Mail format. Of course, remember to add .crt as filter so the exporter recognizes this when exporting your project. The first approach is the simplest: generate a private and public key pair, and put the public pair in the .crt file (again, in PEM format). The private key should go to your server. OpenSSL has some documentation about this. This approach also does not require domain validation nor requires you to spend a considerable amount of money in purchasing certificates from a CA. The second approach consists of using a certificate authority (CA) such as Verisign, Geotrust, etc. This is a more cumbersome process, but it’s more “official” and ensures your identity is clearly represented. Unless you are working with large companies or corporations, or need to connect to someone else’s servers (i.e., connecting to Google or some other REST API provider via HTTPS), this method is not as useful. Also, when using a CA issued cert, you must enable domain validation, to ensure the domain you are connecting to is the one intended, otherwise any website can issue any certificate in the same CA and it will work. This file allows HTTPS connections to virtually any website (i.e., Google, Microsoft, etc.). Or pick any of the more specific certificates there if you are connecting to a specific one.